My kids and grandkids loved the stacking cups toy by Fisher Price. Surely you've seen them – they were a simple shape and came in a stack of rainbow colors. The cups coule be stacked little to big or nested big to little? They had a pattern on the bottom that could be stamped into Play-Do. Well, those cups are gone and I have to say that the new cups are pretty wonderful. I ran across the new Fisher Price stacking cups and had to buy one for a baby. (Remember Theo, the beautiful baby? He got a set.) I also bought myself a set because I just love these things! They are pretty! The cups are numbered which is educational and graphically nice. You can make balls which are fun to roll. Just ask Jack who has already given my set a test run. The little yellow ball makes noise when it moves. 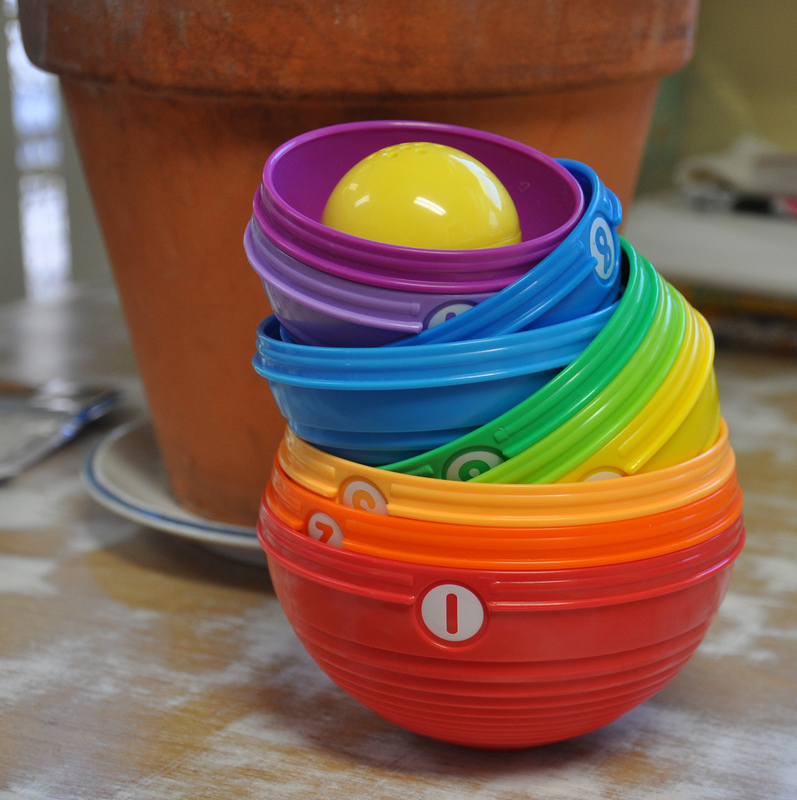 The cups can be stacked and the little ball sits nicely on top. 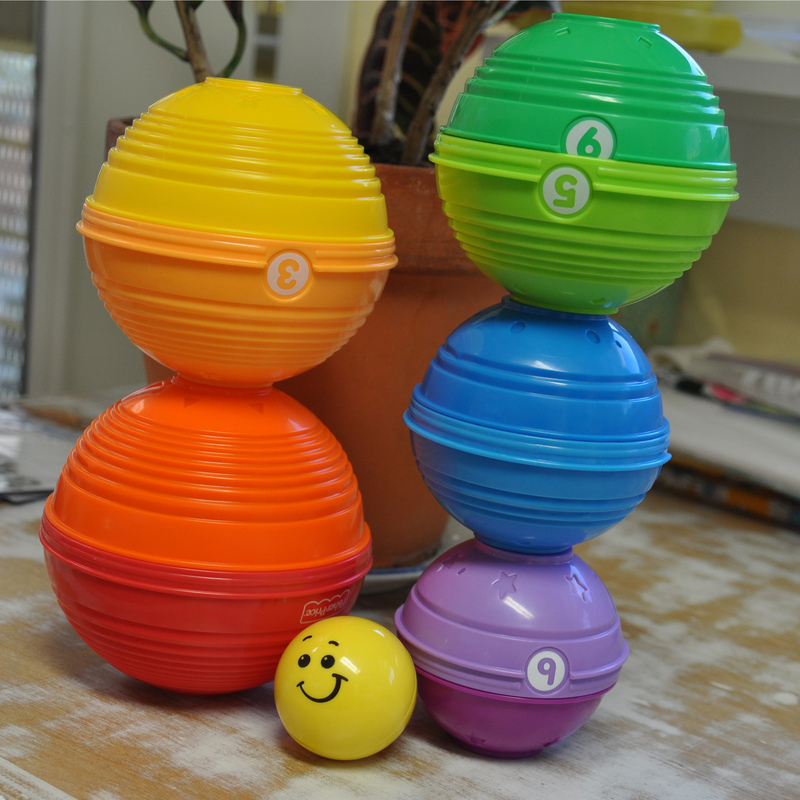 The balls can be nested which makes this an easy toy to store – you end up with the one biggest ball and everything else inside. I have my ball out in the studio ready for those times when I just want to stack some cups or see the pretty colors :-). I don’t have a baby to buy for, but I do have a kitten. He is soooo busy!!! I saw these and when I saw the stack in the display, I said “Aha!” — or something like that, anyway. I bought them and stacked them for him with the ball that makes noise on the top. Now, I had already played with him with the ball for a while, so he was excited to see the ball again, and he ran on our wood floor, slid into the stack and, smack! – “GOT THE BALL! !” It was so cute to watch him. He would play with the ball for a while and then push it with his nose over to the others that were scattered and look at you like “Well?” Of course, he has me trained, you know. We played like that for almost an hour, which I think is a long time for a kitten. He has some traits of a dog. He wags his tail when he wants you to do something, standing in front of you and looking up at you, just like a dog. I told my DH I didn’t know if we should call him a cat — maybe a cog or a dat, because of those traits. Anyway, love the FP stuff, too, but for my animals, not my kids or babies.